My 81/2 yr old Arthur has been a paw licker for several years. After several of vet visits and money, we found a solution that works well for us. We have never had to give oral medicine although many have been recommended. The consensus is that the licking starts because of irritation. First time was a splinter and other times have been fox tails etc. but mostly seems to start as environmental allergy that gets worse by licking and ends up as a fungus infection similar to athletes foot or Candida infection like in baby diaper rash. The major importance is to catch it quickly and to keep his feet dry.. I try to keep his feet and toe nails trimmed and always dry his feet with a towel when entering the house during wet weather. I have several pair on toddler cotton socks and cheap doggy boots for him that I buy over the internet. As soon as he starts licking, I slather an over the counter antifungal on to his paw and rub it in well. Antifungal powder and spray also work but Arthur prefers ointment. I like Lotrimun the best but they all work. Then I put a sock on the affected paw and cover it with the bootie which has velcro. Often then he will start licking another so it then gets same treatment. If I am in the City and it is dry weather, I often leave the sock and boot on for a couple days as long as it stays dry. In wet and snowy weather, I take the sock and boots off for outside and replace when inside. Sometimes I just use system at night. 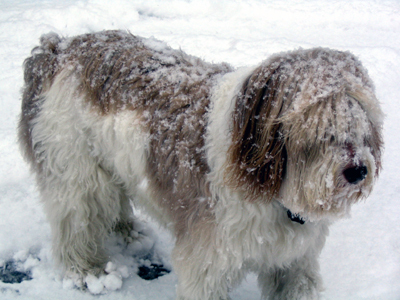 When Arthur plays in the snow, he always wears socks and boots because his feet get so irritated with snow balls. This sounds like a lot of work and it is but often he goes for months without problems. Make sure the socks are cotton and wash in hot water between wears. If his paw(s) is really irritated I will add 1% cortisone for the itching but I prefer not to do this as cortisone prolongs healing time. I’ve also tried tea tree oil but it doesn’t work as well. Yes, in the beginning Arthur worked full time to take the boots off and he eventually won but doesn’t even try anymore.